THIS SELF-CLEANING HOUSE SHOULD’VE BEEN MORE POPULAR THAN THE IPHONE – SO WHY WASN’T IT? I hate cleaning my house, so I just don’t do it. That sometimes leads to situations like the time I began sorting through a pile of sweaters on the floor of my bedroom and uncovered a writhing nest of silverfish. Still, I refuse to clean. Imagine my surprise when I recently learned there’s a decades-old solution to my problem that no one told me about. 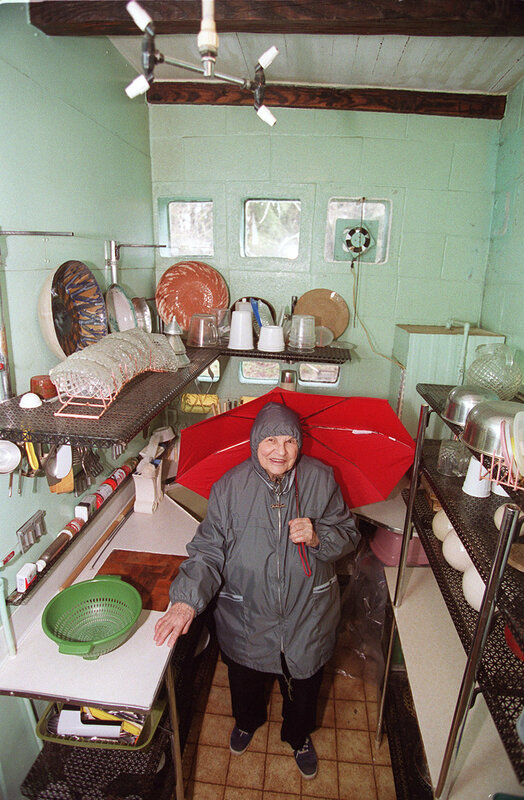 Frances Gabe, an Oregon woman, built the world’s first (and only) self-cleaning house back in the early Eighties. It was a modest cinderblock house of about a thousand square feet; it took her ten years to build, cost about $15,000, and required one of the longest patents ever filed. And, yes, it cleans itself. It worked like this: in the ceiling of each room was a rotating spigot that dispensed soapy water. The floors, which were covered with several layers of marine varnish, were subtly sloped towards drains. Everything in the house was waterproofed. The furniture was upholstered with a material one newspaper described as “a cross between leather and Flubber,” the books were sealed behind waterproof barriers (and were also covered in the “Gabe Self-Cleaning Book Jacket,” according to her patent application), and even the paintings on the walls were covered in plastic. You push a button, soapy water sprays everywhere, runs down the walls and the paintings and the waterproof furniture, swirls down the drain, and then fans dry the place off. There were even mesh shelves for the dishes and a specially-constructed closet where clothes on hangers would be washed and dried. Yes, that’s right – no more laundry or dishwashing. She even designed the plumbing so that water exited through the doghouse, giving the dog an impromptu bath. This should’ve been bigger than the iPhone. So why wasn’t it? Gabe came up with the idea for the self-cleaning house when her young child threw fig jam against the wall, and an exasperated Gabe grabbed the garden hose and sprayed it off. Years later, after divorcing her husband of 35 years, she’d sunk into a deep depression. After praying for a reason to go on, Gabe said that two angels appeared on her shoulders and began whispering to her. She quickly grabbed a pencil and began sketching out what would later become the patent for the self-cleaning house. For years, Gabe gave tours of the house – $25 for the first person, $5 for each additional person in the group. But a flood and an earthquake damaged the intricate plumbing, and in later years the only room that still self-cleaned was the kitchen. Some visitors reported that the self-cleaning house had become cluttered and dusty. In 2002, the self-cleaning house’s patent lapsed, and Gabe didn’t bother renewing it, and around 2009, she moved to a nursing home. She died in December 2016. Today, the house is owned by a man named Sterling Parker, who Gabe’s family describes as a “hippie.” In a recent interview, Parker said most of the self-cleaning house’s plumbing had already been removed when he bought it, and that he plans to use the remaining cinderblock structure as a wintering place for honeybees and a way station for long-distance bicyclists.